Women in the Arts and Media Coalition: WomenArts Needs You! Our twentieth anniversary year has been a huge success so far. With help from supporters like you, we expanded SWAN Day to seven new countries, convened our first international summit, and published a benchmark report on gender discrimination in theatres in our home town. 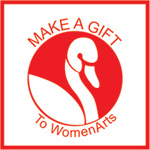 PLEASE MAKE A GIFT TO WOMENARTS! Seven New Countries Join the SWAN Day Celebrations! We created Support Women Artists Now Day/SWAN Day eight years ago because we wanted to give women artists a way to see themselves as part of an international movement. There have now been over 1,500 SWAN Day events, and seven new countries joined us this year – Finland, Czech Republic, Italy, Turkey, Nigeria, Tanzania, and New Zealand! SWAN Day empowers women artists because they discover they are not alone. Together they have created SWAN plays, films, videos, dances, paintings, sculptures, photography, rock concerts, chamber music, and several operas. SWAN Day is building our movement. It develops new leaders, and once artists have the experience of working together on SWAN Day events, they start sharing other resources and information. In April 2015 WomenArts convened our first international summit on gender parity in theatre in collaboration with New York’s Women in the Arts & Media Coalition and Equity in Theatre (a coalition of nine Canadian organizations). 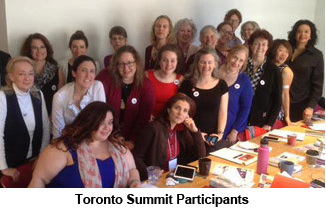 We gathered 21 feminist theatre activists in Toronto to review the growing body of research on women’s employment in theatre, share advocacy strategies, and discuss ways to transform our local efforts into a paradigm-shifting international movement. It was totally exhilarating to have activists from New York, Los Angeles, Boston, Chicago, San Francisco, and Canada in the same room. Although we knew each other’s work, most of us had never met in person. It was a game-changing meeting, and the national press took notice. The summit was covered by American Theatre, Howlround, and The Dramatist. WomenArts Executive Director Martha Richards was invited to speak about the summit at the Opera America national conference in May; the Statera Foundation conference in Cedar City, Utah in July; and the Women’s Voices Theatre Festival in Washington, DC in September. She also participated in a follow-up summit in New York in December. Finally, in the San Francisco Bay Area, WomenArts commissioned a benchmark report about the status of women in Bay Area theatres, the Not Even Report, by Valerie Weak of the Counting Actors Project, in collaboration with Martha Richards, Executive Director of WomenArts, and Christine Young, Associate Professor of Theatre, University of San Francisco. 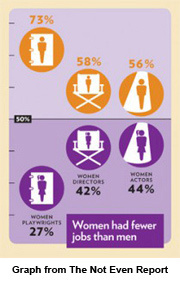 The study revealed that even in this region that is known for its progressive values, only 27% of the plays produced at local theatres were written by women, and women lagged behind as directors and actors as well. When we published the study, it was shared on social media with over 10,000 individuals and organizations across the country. The Not Even Report made gender discrimination a hot topic in our local theatre community, and we are seeing more plays by women this year! We have come a long way in the past twenty years, and as we discover powerful new ways to move forward, your gifts make each step possible. WomenArts, 1442A Walnut Street #67, Berkeley, CA 94709.